Love Live! Sunshine!! Aqours Sky-High! is a collaboration side story with ASCII Media Works' Dengeki G's Magazine, music label Lantis and animation studio Sunrise's multimedia franchise Love Live! Sunshine!! It is unlocked after completing Chapter 8 Story - The Iron Titan . We'd love to see you at our concert! to put a smile on your face! All nine Aqours members are recruitable, but they are together in groups of three based on student group. Thus, there are technically three new recruitable units. Healing is boosted when below 50% health. Duration: 4 turns and a local Clarity. EMP is active even on the backline. 35% DA on a 5/8 uptime attached to RevitalizeRecover HP each turn. Boost to charge bar if HP is full. , but only 5% TA. 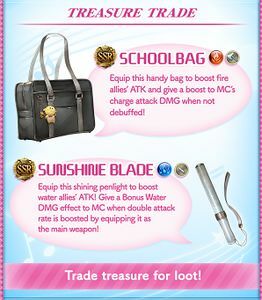 Guaranteed Dodge that lasts three turns, but only grants Hype once. Support Skills work from the backline. On the next turn, it'll have 5 turns remaining. with high uptime. 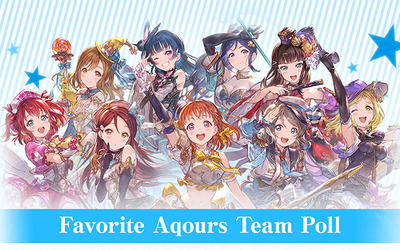 During the original event run, players could vote for their favorite Aqours team! 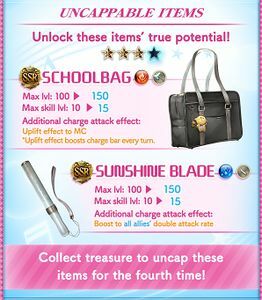 The team with the most votes will be celebrated by having their 5★ uncap in a future update! Results were announced on 5 p.m., Aug 22, 2018 (JST). 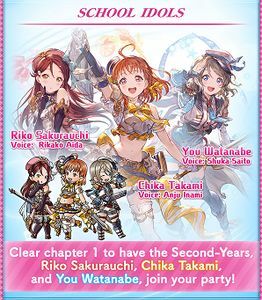 The Second Years' 5★ uncap, illustration and Fate Episode have been added alongside the release of this Side Story. Plain damage to all allies based on 30% of current HP. Plain damage to Nihilith based on 5% of current HP. Cost to Host: 20 AP Unlock: Clear Ward Off Nihilith's Power! performing under a group called Aqours! We're having a concert soon! How about it? Would you like to come see our sparkling performance? The time and place are printed on this flyer.. Here, take one! Eheheh... I hope you can make it! "Love Live! Sunshine!! 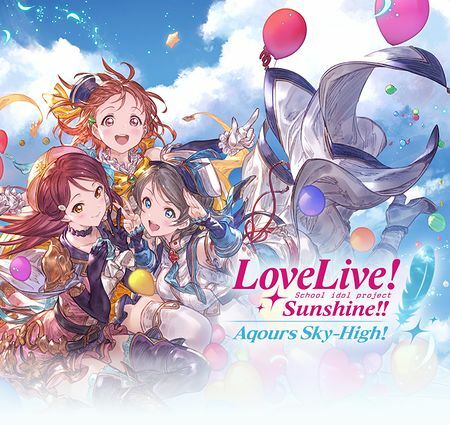 Aqours Sky-High!" The trailer is narrated by Chika Takami, voiced by Anju Inami. The trailer BGM is "Previously on Love Live! Sunshine!! ", from the Love Live! Sunshine!! anime's 1st season soundtrack, Sailing to the Sunshine, composed by Tatsuya Kato. The 1st pre-chorus part can be heard during the 2nd part (Verse 1 - Pre-Chorus 1) of the song, but lyrics can't be shown because it cuts straight into the Instrumental version. 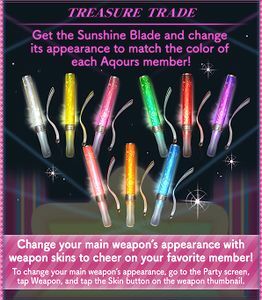 The Charge Attack and skill names of the Aqours characters are references to song titles and member catchphrases. Same as for the trophies. 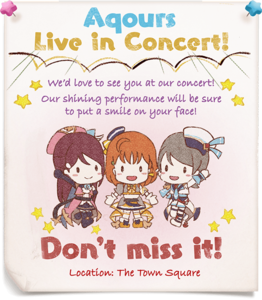 This event is to promote the movie, Love Live! Sunshine!! The School Idol Movie Over The Rainbow, which premiered in theaters on January 4th, 2019 in Japan. 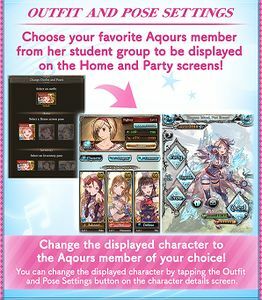 The in-game flyer for Aqours' concert is a GBF adaptation of the flyer from Love Live! Sunshine!! Season 1. 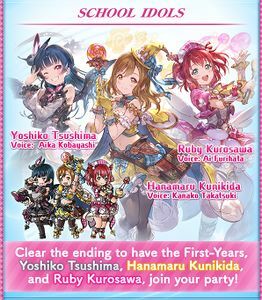 Voice actors who have worked with both GBF and Love Live! 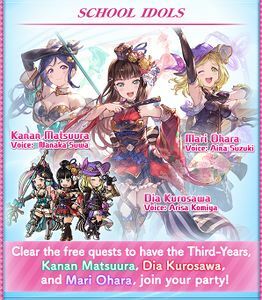 include Aya Uchida (Andira in GBF, µ's' Kotori Minami in Love Live! School Idol Project) and Nao Taoyama (Lyria in GBF, Yukiho Kosaka – younger sister of µ's leader Honoka – in Love Live! School Idol Project). The idol outfits Djeeta and Lyria wear are the same as from Kimi to Boku no Mirai. Io wears a similarly designed idol outfit, but she is not a member of Granblue Fantasy Idol Project. This page was last modified on 18 April 2019, at 20:35.